Want to learn a little bit more about Triops? Read on! 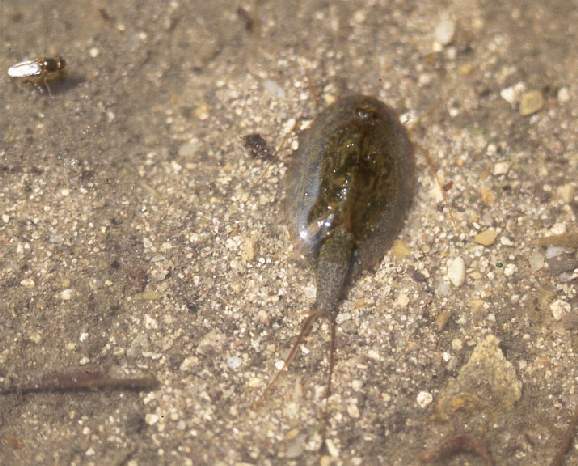 Triops are small crustaceans of the family Branchipoda. Most Branchiopods, like Triops, are able to stay in a state of suspended animation called Diapause when they are in thier eggs. They can stay in the eggs for up to 20 years. Once the eggs come in contact with water, they hatch. Triops grow to about 2-3 inches in length and live only about 20-90 days. They can double i size each day. Triops are predators, eating other animals, especially other Branchiopods. Triops are actually a type of shrimp, and are commonly refered to as Tadpole shrimp, or Dinosaur shrimp. Triops first came into exisitance about 200 million years ago, nearly 1 million years before the dinosaurs came into picture. Amazingly, Triops have remained unchanged for all these years. They will become cannibals and eat their siblings if food becomes scarce. Triops can be purchased at most science or hobby shops, just add water and they hatch in 24 hours. They are much more entertaining then sea monkeys, in fact they eat sea monkeys! This picture of a European Triops was taken by an excellent nature photagrapher. I don't know how he got this Triops to hold still so he could take the picture. This picture will soon become Hyper-Link to his site.